The Cash Acme range of heating products is extensive. From traditional boiler feed valves and dual control products, to air vents, separators and purgers, Cash Acme can meet your heating installation requirements. 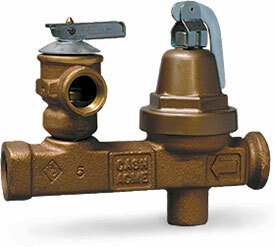 Note: For backflow prevention of boiler water into the potable water supply line, install a BFP valve. Applications Larger hot water space heating boilers that require faster filling. 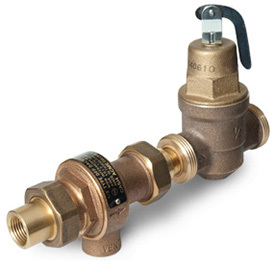 The AB-40 features a brass body and a "combo connection" which allows either a threaded or sweat copper connection with the same union tail piece. The AB-40 also includes a check valve and provides an inbuilt bypass for rapid filling, high pressure testing and system purging. The A-41 provides increased capacity for larger boilers. It has threaded female connections and an iron body with a stainless steel seat. Both the AB-40 and A-41 have a heat resistant diaphragm and seat disc, and an inbuilt strainer screen. The reduced pressure setting is 14 psi. The maximum inlet working pressure is 200 psi. 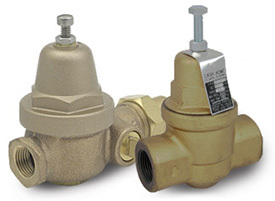 Cash Acme offers the only anti-scaling boiler feed valve in the industry. The A-43CRF features an inbuilt check valve to retard reverse flow of boiler water. The A-43CRF and the A-89 feature rapid fill capability and the A-89 also includes a balanced piston for closer outlet control regardless of variations in inlet pressure. Standard reduced pressure setting is 14 psi with an adjustment range to 30 psi. Maximum inlet working pressure is 200 psi. 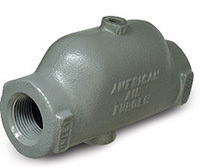 Available with threaded connection or sweat copper union inlet. Applications Boiler water supply lines. To assure automatic filling and maintain boiler pressure between 14 and 30 psi. All bronze construction, inbuilt stainless steel strainer screen, neoprene and bronze diaphragms, brass and stainless steel seat, renewable relief seat disc. Includes an inbuilt check valve to retard reverse flow and an inbuilt bypass for rapid filling, high pressure tests and system purging. Reduced pressure setting of 14 psi and relief setting of 30 psi for two-story buildings; slightly higher setting for 3-, 4- or 5-story buildings. Maximum inlet working pressure is 100 psi. 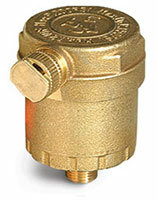 Combines a pressure reducing and regulating valve, positive relief valve and bypass valve into one compact unit. Applications Designed for hot water space heating installations. Bronze body features large unrestricted waterways, special heat resistant composition diaphragms, silicone relief seat and an easy to clean inbuilt stainless steel strainer. 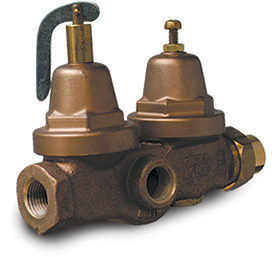 All units have a test lever and an inbuilt check valve to prevent backflow. Provides pressure control and protection from thermal expansion. Note: The relief section of all Cash Acme dual controls is for thermal expansion only. 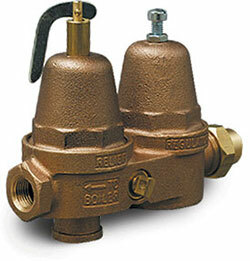 For proper pressure relief protection, the boiler must also be provided with a properly sized ASME-rated relief valve. 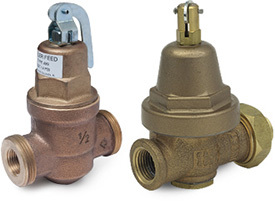 Applications Designed for hot water space heating installations, the CR Series valve is suitable for 1-, 2- or 3-story buildings without adjustment. Balanced piston for closer outlet pressure control regardless of variations in inlet pressure and a rapid fill feature with an improved larger seat for higher capacities and quicker fill. Has an iron body, brass internal parts on the regulator, special heat resistant composition diaphragm and O-rings, brass strainer screen, and stainless steel springs. Relief valve has bronze body, silicone seat disc and stainless steel spring. Applications Designed specifically for smaller boiler feed lines. The Cash Acme BFAC combines the quality pressure reduction of the Cash Acme A-89 Pressure Reducing Boiler Feed Valve with the effective backflow prevention of the Cash Acme BFP Double-Check Backflow Preventer. The Cash Acme BFAC accurately reduces system pressure down to 14 psi while preventing the back-siphonage of contaminated water into the potable water supply. The BFAC features threaded (NPT) inlet and outlet connections. Applications For use in heating systems to trap entrained air from the circulating water. Sizes 1", 1-1/4", 1-1/2", 2", 2-1/2", 3" and 4"
One piece cast iron construction. No service required. Economical and easy to install. Applications For use in heating systems to vent air trapped within the circulating water. Brass construction. No service required. Economical and easy to install.